Steelray Software is a Citrix Ready Program member and tests Steelray with Citrix to ensure compatibility and performance. They also participate in the Citrix Developer Network. Steelray is a member of the Project Management Institute (PMI), MPA and the Better Business Bureau (BBB). 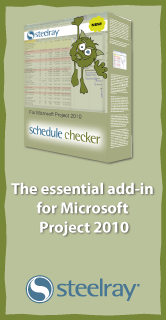 Don't allow your MS Project 2010 users to miss out on Schedule Checker, an exciting and extremely beneficial add-in! Schedule Checker will help Project 2010 users write better quality schedules by finding and suggesting fixes to problems within the schedule critical path. With a more believable critical path, your MS Project users will love the increase in accuracy within their project and in turn an increase in efficiency with their daily work activities. Steelray Project Analyzer takes the pain out of creating, maintaining and delivering quality schedules. With Steelray Project Analyzer, you can evaluate your project schedule for quality and performance in minutes and produce understandable results. And with the Steelray Coach, you can address issues and maximize schedule performance quickly through clear, actionable guidelines for success. Analyzing a schedule really is that simple. Steelray Project Analyzer is compatible with Microsoft® Project (2003, 2007, and 2010), Project Server 2007, and Primavera P6. You can create reports as Excel spreadsheets, PowerPoint presentations, Word documents, web pages, or dashboards. You can customize reports and existing criteria or develop new criteria using our Criteria Editor. Just click on dashboard links to navigate directly to the problem areas in your schedule so they can be addressed, or share the information with others in minutes. Check schedule quality and performance in a few minutes or less. Project Analyzer’s automated process is far more reliable than tedious manual processes or home-grown programs. The technology is fully compatible with Microsoft Project 2010. Download and install it here. Download a free, no-obligation demo version of Steelray Project Analyzer in minutes to test-drive the technology for yourself. Steelray Project Viewer gives you the power to easily share your Microsoft; Project schedules with your entire organization – for less than 6% of the cost of Microsoft Project. If your organization uses Microsoft Project, viewer software like Steelray Project Viewer is a cost-saving essential. Everyone will be able to view, navigate, print and export Microsoft Project schedules, but no changes can be made to them. With our .mpp file viewer, you will save thousands in licensing fees and provide the right tool for the right users. It really is that simple. Steelray Project Viewer is a Microsoft Project .mpp file viewer that opens files and empowers the entire project team to view the project information in an easy-to-understand format. Open Project files without Microsoft Project. Our viewer software is fully compatible with Microsoft Project 2010. Download and install Steelray Project Viewer here. Download a free, no-obligation demo version of Steelray Project Viewer to test-drive the technology for yourself. Steelray Schedule Checker is a Microsoft Project add-in that helps you write a better quality schedule by finding and suggesting fixes to problems in your schedule. In the same way you would use a spell checker in a written document, Schedule Checker is faster, will catch more problems than you would catch with manual checks, and ultimately will result in a higher quality schedule with a more accurate critical path. Better Schedules — Using Schedule Checker will help Microsoft® Project calculate a critical path that is believable, because it will find and show you how to fix issues that can distort the critical path. Time Savings — Schedule Checker saves time, in the same way that a spell checker will find spelling problems much faster than a manual check. Visibility — Schedule Checker discovers schedule or data problems that are difficult to find by checking manually. Guidance — Schedule Checker guides you every step of the way. It explains why you should care about the problems it finds, explains terms you may not be familiar with, and shows you how to fix the problems step by step. Download a free, no-obligation demo version of Steelray's Microsoft Project add-in, Schedule Checker, in minutes to test-drive the technology for yourself.